Daily daycare will provide your best friend with hours upon hours of play-time, socialization, and of course, supervision while you are away during the day. A typical day at daycare begins at 7am when mom and dad begin to drop off their “furry children.” The dogs are arranged into play groups according to size, age and temperament. From morning until evening, the dogs play with one another, frolicking in our over 3,000 sq. feet of play area and outdoor area until mom and dad arrive in the evening to pick up their tired, happy pups for a peaceful evening of rest and relaxation at home. Half days are another daycare option. Your dog may be dropped off at any time during the day and stay for up to 5 hours. If your schedule is hectic and you’d like to drop your pup off for a couple of hours of play-time, you are welcome to do so at any time for an hourly rate. Staff members at The Dog Bark are more than happy to provide first-time visitors with a tour of the facility and answer any questions you may have. 1. All dogs must be spayed or neutered to attend daycare (if over 6 months of age). The minimum age to attend daycare or boarding is after your puppy has received their 3rd round of shots. All daycare playmates must also be in good general health and be non-aggressive. 2. If your pet meets the above requirements, we must receive written verification from your veterinarian that your pet is up-to-date on vaccinations including Rabies, DHLPP/DHPP (Distemper, Hepatitis, Leptospirosis, Parainfluenza, Parvo), Bordatella, and Canine Influenza. Your vet will most likely be happy to fax the information directly to The Dog Bark at (503) 990-6782. 3. The next step is to fill out all of the necessary forms contained within the daycare application which can be found on the forms page. We require a completed and signed daycare application form which also contains a release of liability and a medical release form. The various forms will be discussed when we meet. Within the daycare application, we ask that you sign a waiver ensuring that your dog is on a continuing flea/tick program. 4. Once you have submitted the vet documents and have filled out the appropriate paperwork, it is time to make a reservation for the evaluation and trial day of daycare. The Dog Bark accepts all breeds but does require every dog that enters our play area pass a temperament test. This one-time evaluation takes about 10 minutes and simply put, will consist of a series of planned exercises designed to test the dog’s potential for aggressive behavior while determining the current level of social development. We ask that you please make a reservation for this one-time evaluation on our reservations page. n order to provide your dog the most positive first experience at The Dog Bark, it is strongly encouraged to schedule the evaluation as early as possible in the morning. It is far less intimidating for your dog to be one of the first dogs in the pack, rather than to walk into a room full of rambunctious dogs. Assuming your dog passes this test, you are welcome to leave your dog in our care for daycare. If your dog acclimates well and is not fearful or stressed, we will move forward with our new pack member! Reservations: Please make reservations for your dog on our reservations page to guarantee your dog’s spot in daycare. Dogs with reservations will be given priority over dogs without because there is a limit to how many dogs we are able to care for each day. You may also make reservations in our store. Cancellations must be made by no later than 6:00pm the evening before the scheduled day of daycare. Please see the cancellation policy found in forms for details. Drop-off/Pick-up: For your convenience, you are welcome to drop off your pet as early as 7:00 am. Don’t be surprised if you are dragged through the doors! 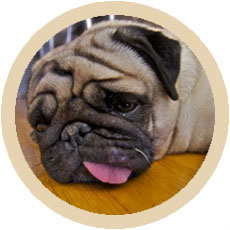 Please pick up your tired pup no later than 6:30 pm, our closing time. There is a 15 minute grace-period because we understand that things come up! However, beginning at 6:45 pm we will be forced to charge a $5.00 late fee, and at 7:00 pm, we will board the dog for the evening and charge an overnight boarding fee. Multiple Dog Discount: 25% off of a second package for the same family. *Packages are non-refundable and non-transferable. They do not expire. Packages do not guarantee service without a reservation.